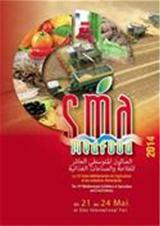 Sfax International Fair Association organizes the 10th Mediterranean Exhibition of Agriculture and Food Industry from 21st to 24th May 2014 in the city of Sfax, Tunisia. The aim of this Exhibition is the promotion of agricultural and food industry products and the meetings among businessmen of these sectors, as well as being an interface reflecting the developments in the level of production, services or other commercial activities in the Mediterranean. For those willing to participate, more information can be found here and here.